The new Moto Guzzi V9 Bobber Sport made its debut at the Moto Guzzi Open House 2018, the must-attend event for all Eagle brand lovers, at the historic Mandello del Lario plant on Sept. 7-9. Thousands of enthusiasts were the first to discover the latest evolution of the V9 range. V9 Bobber is the sport custom that gave life to the medium engine capacity bobber segment. It is a bike with a unique personality, essential in its shape and with a look marked by its numerous, total black details and its oversize tires. The new V9 Bobber Sport stands out with its lowered single-seat saddle which, combined with the usual low drag bar supported by lower risers, leads to a more accentuated “low ride,” with a compact and sport-oriented position. 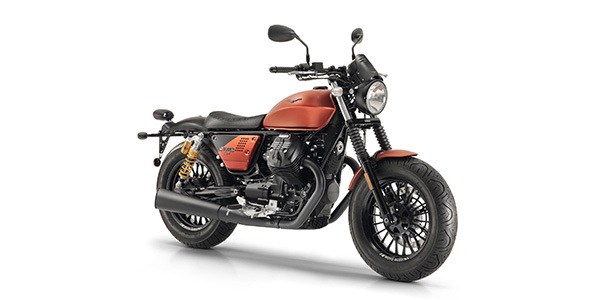 The special dedicated color scheme, a brand-new gritty orange, covers the fuel tank – with the Moto Guzzi eagle done in a burnished finish which also extends to the aluminum side panels, thereby mixing with the V9 Bobber’s typical matte total black look. The dark shades also spill over into other parts such as the engine cooling fins, the fuel cap in billet aluminum, the headlight frame and the instrument cluster graphics. The Moto Guzzi V9 Bobber Sport will be available in December.